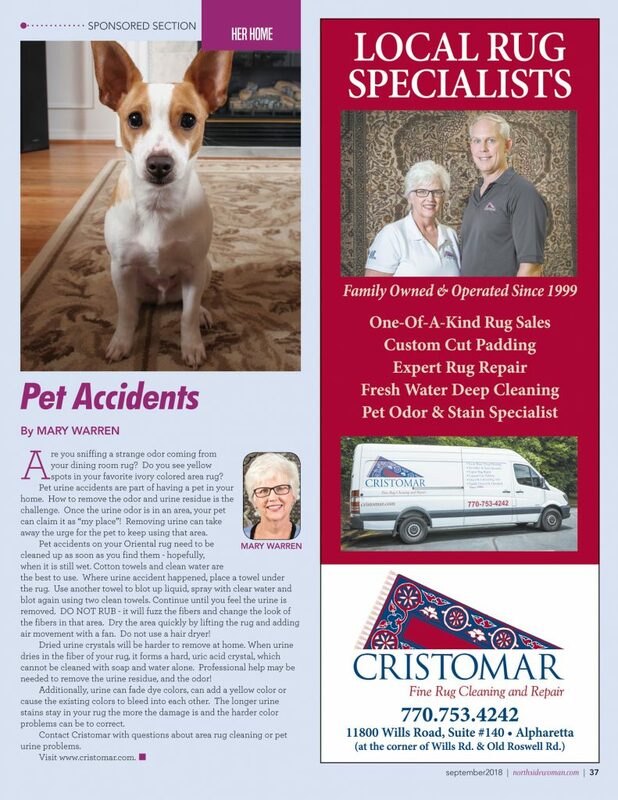 This is a sponsored news article, from “NSW” (Northside Woman Magazine), published (September, 2018) by Appen Media Group, Alpharetta, GA; with an article on “Pet Accidents”. Are you sniffing a strange odor coming from your dining room rug? Do you see yellow spots in your favorite ivory colored area rug? Pet urine accidents are part of having a pet in your home. How to remove the odor and urine residue is the challenge. Once the urine odor is in an area, your pet can claim it as “my place”! Removing urine can take away the urge for the pet to keep using that area. Pet accidents on your Oriental rug need to be cleaned up as soon as you find them – hopefully, when it is still wet. Cotton towels and clean water are the best to use. Where urine accident happened, place a towel under the rug. Use another towel to blot up liquid, spray with clear water and blot again using two clean towels. Continue until you feel the urine is removed. DO NOT RUB – it will fuzz the fibers and change the look of the fibers in that area. Dry the area quickly by lifting the rug and adding air movement with a fan. Do not use a hair dryer! Dried urine crystals will be harder to remove at home. When urine dries in the fiber of your rug, it forms a hard, uric acid crystal, which cannot be cleaned with soap and water alone. Professional help may be needed to remove the urine residue, and the odor! Additionally, urine can fade dye colors, can add a yellow color or cause the existing colors to bleed into each other. The longer urine stains stay in your rug the more the damage is and the harder color problems can be to correct. To contact Cristomar, you can use the “Contact Us” Tab and scroll down to “Drop Us a Note”; or call: 770-753-4242. We look forward to hearing from you so we can discuss our pet urine pre-wash treatment and other cleaning or professional care needs for your antique, oriental or area rugs.